It’s hard to believe that I’ve been writing the PopCult blog here at the Gazette for seven years. Sometimes it seems like I just started, and sometimes it seems like I’ve been doing this forever. To mark our anniversary week, we’re going to go back and revisit some of the highlights from PopCult, including examples of Monday Morning Art, Radio Free Charleston and The PopCulteer, along with some long-ago events like Rant Week and Andy Prieboy Week. This is a stream-of-consciousness compilation, compiled and annotated as I browse through the archives. You many notice that all the early posts are credited to Gazz editor, Douglas Imbrogno, who is the guy to blame for me getting this gig. While he did recruit me to write PopCult, he never wrote it himself. His name came up as the author of the old posts when we migrated from using the the Blogger interface to WordPress. Let’s hope that this glitch doesn’t cause too much harm to Doug’s reputation. At the head of this post you see the first of three episodes of Radio Free Charleston devoted to Tribute To The Troops II. On August 11, Wood Boys Music took over the Saint Albans City Park Amphitheater for an all-day all-ages benefit show for our troops. 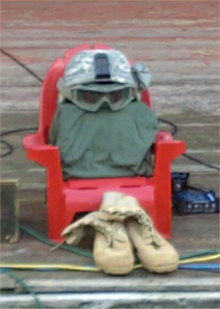 Over eleven hundred dollars was raised for The Wounded Warrior Project and The West Virginia National Guard Foundation, and our cameras were on hand for the first half of the concert. In the next three weeks you will hear music from Breedlove, The Under Social, Remains Unnamed, Deck of Fools, Johnny Compton, Point of Jerus, our guests on this week’s show, “Real American Hero Shirt,” are HarraH, In The Company of Wolves, and Everpulse. The show kicks off with Cadence Weaver singing the National Anthem. Today’s art is a new take on the first piece of my art that I posted here in PopCult. 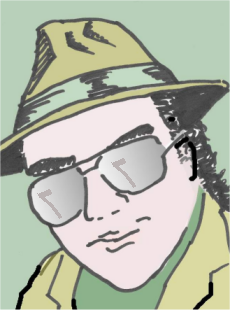 Tuesday marks seven years since this blog began its life as an eclectic hodge-podge of pop culture news, criticism, music, art and video. So I decided to go back to the beginning and produce a new take on the humble little digital painting that started it all. Plus it was really easy to crank out Click to see it bigger. One of my childhood inspirations has passed. No one else can be the first. Rest in peace, Mr. Astronaut. 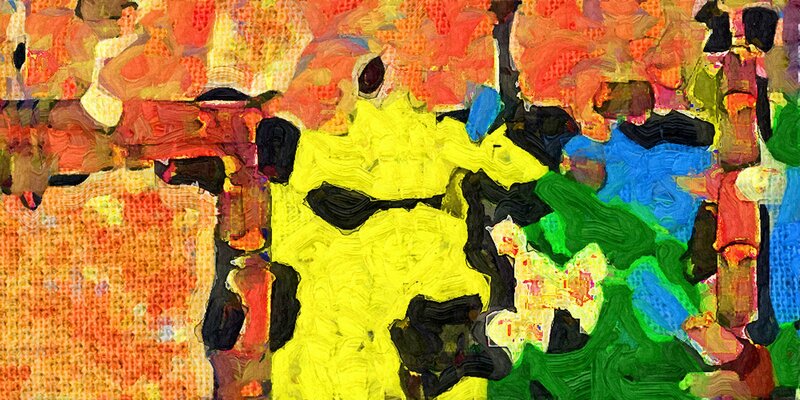 Welcome to our first multi-part photo essay in The PopCulteer. 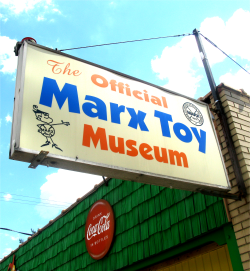 As a sort of early present to our readers, just a few days away from PopCult’s seventh anniversary, we are bringing you photographic evidence of a trip we took last week to The Marx Toy Museum in Moundsville, West Virginia. It was an incredibly pleasant trip. The weather was perfect. The museum was easy to find. Francis Turner, founder of the museum and Candy, who was working as a docent the day we showed up, were warm, friendly and gracious. I’ve been reading about Francis and his amazing collection for years, and it was great to finally meet him in person. The Marx Toy Company was, at one time, the biggest toy company in the world. 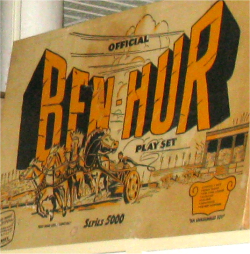 One of their main factories was located in Glen Dale, West Virginia, only a few miles from the site of The Marx Toy Museum. There’s a real sense of community on display here, as so many people in the area worked for Marx. At the museum you can learn about the history of Louis Marx, his wonderful toys and the people who made them. This photo essay cannot possibly replace the actual experience of going to The Marx Toy Museum. You can’t imagine how cool it is to see this much toy history in one place. It’s a great day trip, and I recommend it to anyone in the Charleston area. If you grew up any time before the 1980s, The Marx Toy Museum will bring back many childhood memories. You may overdose on nostalgic glee. If you’re younger, you will still find the toys of yesteryear to be fascinating. This photo essay is broken into five parts, so that the graphics don’t overwhelm your browsers. Convenient links will be posted at the top and bottom of each essay, so that you can jump around at will. In this part of our photo essay, we will look at the historical high points from the story of The Marx Toy Company. We’ll begin with a look at some of the classic tin toys and early licensed items featuring Popeye, Mickey Mouse and others, and we’ll follow the trail of toys all the way to the huge riding toy successes of the 1970s. We’re also going to explore the prototype room at The Marx Toy Museum, which is filled with one-of-a-kind sample figures, original hand-carved models, original art that was used on the packaging and unreleased playsets and toys. As seen all over The Marx Toy Museum, one of the most collected types of toys made by The Marx Toy Company are the plastic playsets. 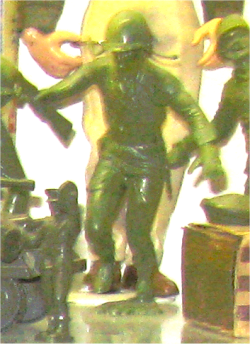 Marx was a pioneer in using plastics in toys, and after finding success with his Green Army Men, he expanded the concept to include playsets featuring Cowboys, Space Men, Presidents, cartoon characters and historical conflicts. This photo essay will focus on the plastic people, and how they mutated into the modern action figure. If you’re interested in learning more about Marx playsets, you might want to check out Playset Magazine and Playset Videos. 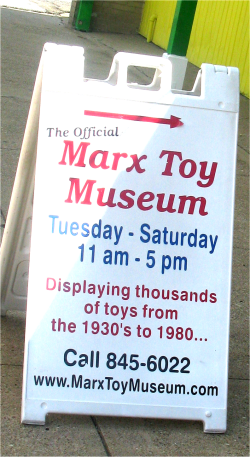 I have to admit, it wasn’t the dollhouses, teasets, or bsbydolls that made me want to visit The Marx Toy Museum. I’m a guy. I’m interested in the action figures, cars, trains, toy guns and other cool stuff. However, The Marx Toy Company made some pretty cool stuff for girls, too, and The Marx Toy Museum has plenty of it on display. So wives and girlfriends should know that they won’t be bored as us guys ooh and aah over all the cool stuff. You’ll have cool stuff to ooh and aah over too. 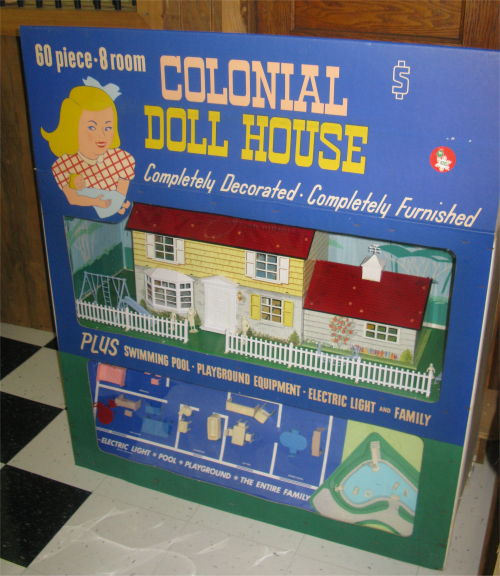 So at the great risk of giving this blog cooties, let’s look at the toys that Louis Marx made for girls. Okay, I admit it. This was the main reason I wanted to go to The Marx Toy Museum. As longtime readers of PopCult know, I am a Johnny West collector. 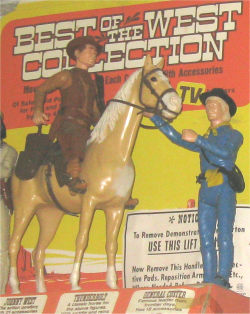 Johnny was the foot-tall Western answer to GI Joe. He was made differently, but Johnny and his pals were built solidly, and to be honest, they made better animation models than GI Joe did. 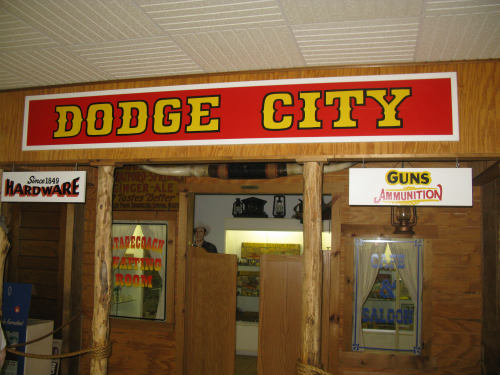 Western toys were a big money-maker for Marx in the 1950s, and Johnny West carried the tradition on into the 1970s.The Marx Toy Museum has an entire room devoted to their Western toys–the room is even based on an old playset building, complete with swinging saloon doors. We’re going to poke around in the Western room and then wrap up the photo essay with a prolonged look at Johnny West and The Best of the West. If, like me, you are a fan of Johnny West, then you need to know about three valuable resources on the web: First is the Circle X Ranch Yahoo Group. This is a warm, online family for fans of Johnny West, run by Terri Coop, the current owner of the rights to Johnny West. Second is Tom Heaton’s Vintage Toy Room, which is chock full of details and stories of Johnny West, and is also a place where you can buy vintage toys, and Tom’s invaluable Encyclopedia of Johnny West, as well as the exclusive update modules. Finally we have Stewart’s Attic, run by Scott Stewart, where you can find even more background on Johnny West as well as vintage items and some new hats and accessories for Johnny, crafted by Scott, himself. 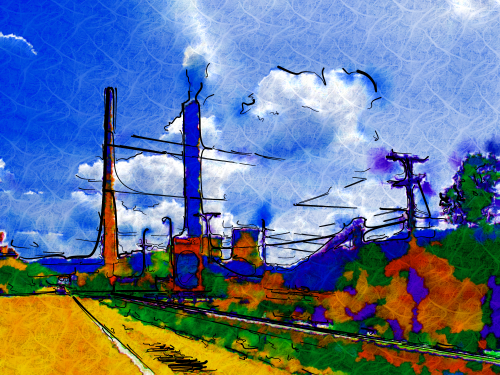 Today’s art is a digital painting I did based on a photo I took last Saturday whilst meandering South on Route 2, somewhere between Moundsville and Parkersburg. It’s a plant of some sort with a power plant behind it. I thought it looked cool. Click to enlarge. Delayed by glitches.